Jason George’s voice had an edge of panic to it that I had never heard before. Rubbing my eyes, I pulled the phone a bit closer. Jason, my deputy wasn’t the kind of man to get rattled. It must be serious for him to wake me at three in the morning. “Say again,” I instructed, switching on the small table lamp beside my bed. I shuddered. I’d dreamt about getting a call like this one day. It was my most recurring nightmare. I dressed in a daze, a hundred images flashing across my mind – images of laboratory rats injected with God knows what, scampering across the darkened countryside. I prayed that they’d been infected with something relatively straightforward like Black Death or Rabies. If the rodents had been injected with anything new – anything experimental – we’d be talking soldiers in silver sci-fi suits quarantining half the country. For about the two-hundredth time, I began to regret accepting the security chief’s job at the institute. It had seemed like a cushy number at first: a doddle for someone like me who was cruising towards retirement. But that was before the rash of break-ins, before the animal rights nuts got their claws into us. Someone had told them about our experiments on rats, monkeys and beagles. Before long we had little commando parties of pissed up students in camouflage jackets and balaclavas trying to cut through the fences. They’d set off the alarms and we’d call the local plod to come and arrest them. I’d always thought of the protestors as a joke, but not now. Lives were in danger and, even if we could get the animals back, I knew my job would be on the line. The dull thwacking noise of the helicopter’s rotor blades snapped me out of my thoughts, and I rushed outside. The swirling down-rush from the blades whipped me, making it difficult to breathe. I cursed as I saw the damage the mechanical hurricane was doing to my garden. We rose swiftly over the slumbering street, heading towards the distant lights of the facility. From the air, I could see the buildings stretching out across the compound. By day it looked like a medium-sized industrial estate, a mish mash of grey, concrete buildings and roads. Tonight, with the criss-cross of security lights twinkling, it looked more like a town. The chopper banked. Below, in an arc of sticky sodium light, I could see three figures. One was Jason, the middle figure was Dr Bailey, one of the institute’s top scientists, but I didn’t recognize the third person. Jason came running as I touched down, head bowed beneath the spinning blades. I nodded silently. Jason always was one for understating the obvious. He dragged me by the arm to meet the others. Dr Dawn Bailey grunted a greeting. She looked shell shocked, her wiry blonde hair dishevelled; eyes red and unfocused. I reckoned, like me, she’d been snatched out of bed. I flashed her a sympathetic look. I shook the Chief inspector’s hand. The grip was firm, firmer than I expected. She blinked, startled, and I smiled to myself. 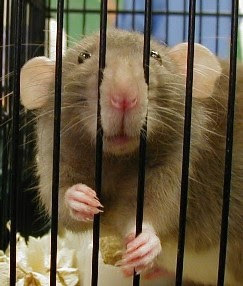 The rats had been housed in an annexe to the main laboratory block. The pre-fab, built by PadPimpers had only been on site a few weeks now and as we ventured inside we were hit by the smell of new paint. There was another smell too – the sour, acid stink of animal house. Jason and I screwed up our noses. Doctor Bailey didn’t seem to notice the strong gamey aroma, which I guessed wasn’t surprising as she worked in it all day. Caroline Jaycock wasn’t bothered either – at least, if she was, she hid it well. We hurried down the corridor, passing caged hamsters, gerbils and kittens; all squeaking agitatedly. Speaking loudly, Doctor Bailey explained what animals were housed there, and what research they were used in. It was all fairly standard stuff – testing new drugs, cosmetics and foods. I snorted at the mention of the secure section. What a joke. It hadn’t been secure tonight. Turning the corner, we reached the high security rooms. To gain access you had to slide a plastic ID card through a sensor. I examined the lock, expecting to find it forced. I swore as the full implication sank in. Unfortunately, Chief Inspector Jaycock beat me to it. There was no other answer. I began to feel very concerned. An infiltrator was all we needed. The door hissed open and we hurried through. Doc Bailey switched on the light and we stood, blinking, as the neon tubes flickered reluctantly into action. Our eyes followed her finger towards movement at the back of the banks of cages. Small dark, beady eyes glared up at us. Whiskers twitched and a long tail swished across the sawdust. “There are still some rats here,” the doctor yelled. “Well at least that’s something,” Caroline Jaycock muttered. Doc Bailey unlocked the filing cabinets and quickly pulled out folders, scanning them furiously. I watched, my nerves twisting. I was aware that fifteen minutes had passed since we entered the labs – we were taking too long. I motioned for the Chief Inspector to join me and started to examine the cages. We checked each empty wire enclosure in turn. They were all the same – the same identical damage. I looked, she was right again. The wire hadn’t been cut – it had been bitten: gnawed right through. I got onto the guards at the perimeter fence, but I knew what they’d find. The wire hadn’t been cut – it had been bitten clean, right through. It was difficult to make ourselves heard inside the helicopter’s noisy interior so we all had to shout. Bailey had finally located all the info we needed and had presented us with a classic good news/bad news scenario. Project Alpha, she explained, was a MOD funded experiment to artificially boost the intelligence of animals by the use of genetic engineering techniques. The idea was that they could be used in battlefield conditions where it was too dangerous for humans. That, I told myself, explained the mystery of the removed homing devices. I was going to add my penny’s worth, but the co-pilot’s voice came over the intercom to tell us the rats had been spotted at a shopping centre five miles away. Below, the flashing blue lights of the police cars gave the scene an unreal fairyland, bedecked with fairy gold and diamond castle like appearance. We hovered over the block of shops, watching as police and troops surrounded the area, then we landed at nearby playing fields. Caroline Jaycock talked steadily into her walkie-talkie, issuing orders to the assembled forces. I felt relieved; maybe I might just hang onto my job after all. At a signal from Jaycock, our party set off into the shopping mall. It wasn’t immediately apparent how the rats had forced their way into the chemists. The shutters on the windows were still intact. It was only when the waiting sergeant showed us the claw marks on the roof, and the missing slates, that it clicked. None of us said anything. I gave Doc Bailey a warning look. I didn’t want her to say anything indiscreet. The storeroom was a mess. The rats had done a thorough job. Boxes lay ripped open, contents scattered crazily across the floor. I’d seen tidier burglaries done by vandals on acid. The policeman held up a plastic mesh carrying case. Inside I could see the black shape of a rat, sitting motionless, whiskers slowly twitching, and eyes – deeply aware eyes – watching us; staring. The animal could have gnawed through the box in seconds, but he was choosing not to. He knew the game was up. Tearing her eyes away, Jaycock examined the damaged carton. I knelt beside her. I frowned, puzzled, as she pointed to the label on the carton and it all suddenly made sense to me. I couldn’t help smiling as I explained it. “It’s all quite simple, Jason. The rats escaped for a reason. To get these.” I motioned to the Nicorette patches strewn across the floor.